Lan Guihua, a widowed farmer, oversees the cooking of lunch for guests and neighbors at her home in Ganjiagou Village, Sichuan Province, China. (She is featured in the book What I Eat: Around the World in 80 Diets). The caloric value of her day's worth of food on a typical day in June was 1900 kcals. She is 68 years of age; 5 feet, 3 inches tall; and 121 pounds. Her farmhouse is tucked into a bamboo-forested hillside beneath her husband's grave, and the courtyard opens onto a view of citrus groves and vegetable fields. 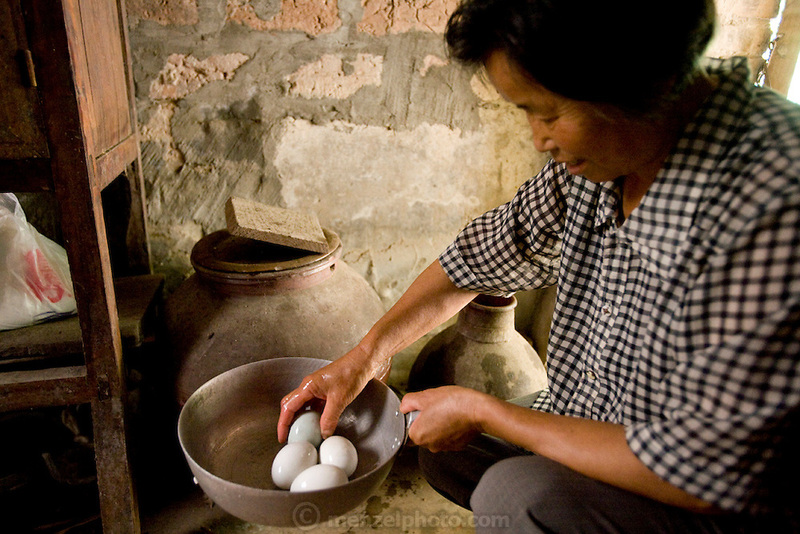 Chickens and dogs roam freely in the packed-earth courtyard, and firewood and brush for her kitchen wok are stacked under the eaves. Although homegrown vegetables and rice are her staples, chicken feathers and a bowl that held scalding water for easier feather plucking are clues to the meat course of a special meal for visitors. In this region, each rural family is its own little food factory and benefits from thousands of years of agricultural knowledge passed down from generation to generation. She lives in the area of Production Team 7 of Ganjiagou Village, 1.5 hours south of the provincial capital of Sichuan Province?Chengdu.